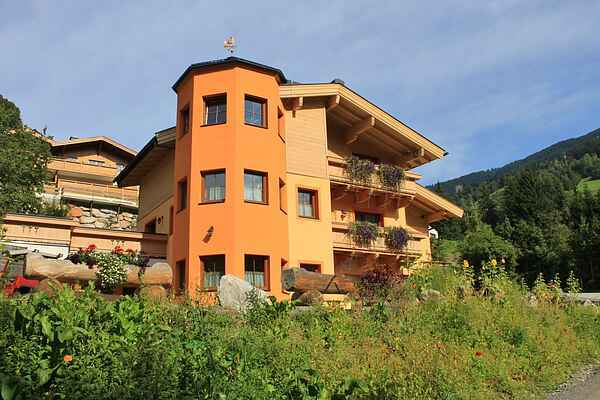 This beautiful holiday home is located directly next to the piste and the Jausern lift, in well-known Saalbach. It's the perfect location in the winter; you couldn't get closer to the piste! You can return to the house with your skis on and leave with your skis on from less than 100 metres from the house. Your spacious holiday home is located on the first floor; however, since the house is built on a hillside, it can also be considered the ground floor. You will be the only ones staying in this holiday home and you'll have your own private entrance. The holiday home features all the necessary luxurious amenities. The spacious living room is furnished like a pleasant Austrian "Stubrl" and offers plenty of room to dine with up to eleven people. You'll also have three bedrooms at your disposal, two of which with a private bathroom. There's an extra private sauna with both a Finnish and infrared sauna and a lovely massage shower; a great place to relax after a busy day hiking or skiing. There's a large, shared ski storage room with ski boot warmers, which can be used to store your (mountain) bike in the summer. You can reserve a breakfast or dinner at the friendly owners, who run a “Jausenstation/Ski hut” near the house. During the winter, you're also welcome for the daily aprés ski of course. Saalbach-Hinterglemm as a skiing destination does not require any further explanation. You won't find more kilometers of ski-slopes so close together anywhere else, and that from early december to mid-April. Cross-country skiing, tobogganing or, of course, the renowned Apres Ski... you'll be taken care of very well in Saalbach-Hinterglemm. During the summer, there are plenty of sport and hiking opportunities, and you will be able to explore the many sights that Salzburgerland has to offer. This house is optimally suitable for 8 people, but can be booked for up to 11 people.